Choosing leather shoes for men can be a very involved process. Do you prefer black or brown leather shoes? * Tip: Leather shoes do tend to get dirty and damaged from being stepped on or scraped against concrete; therefore, we would like to advise that if you own a pair of expensive leather shoes that are dirty or damaged, you do not necessarily have to buy a new pair. Professional leather shoe cleaners can do a darn good job of restoring worn out leather shoes for a very reasonable price. If you are in Toronto and would like your valuable leather shoes to be cleaned professionally check out leather shoe cleaning by Love Your Shoes. They are experts at boot and shoe cleaning and restorations. 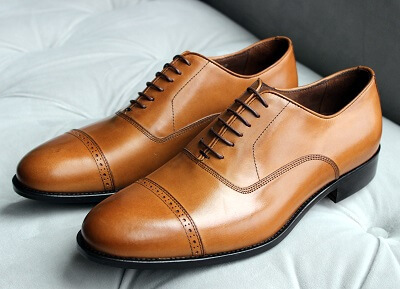 To begin, let’s review different styles of leather shoes for men. After choosing a style, we can then explore appropriate colour choices in more detail. It is important to note that although each of the styles listed below can be made with leather, it is not always the case. The objective here is to identify your preferred style of shoe. 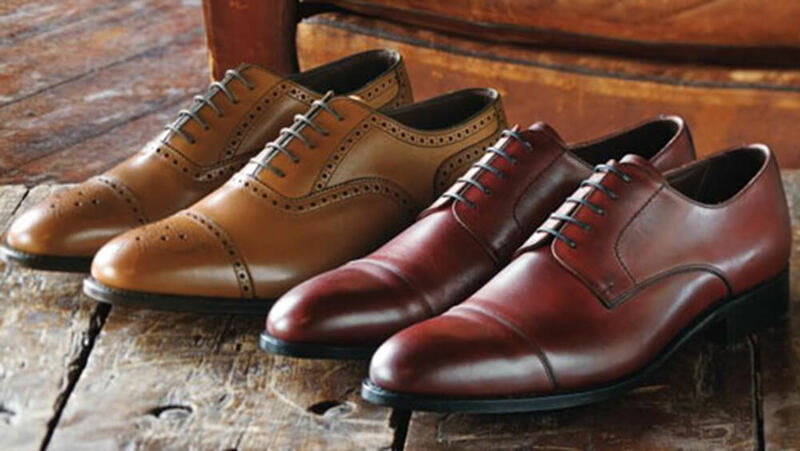 Choosing leather shoes in an Oxford style means selecting footwear with very few frills or embellishments. These are a popular choice because their simplistic and classic appearance is appropriate for numerous occasions and settings. Oxfords are characterized by their low instep, closed lacing, and non-rubber sole. They are most often paired with suits, or a dress shirt and trousers. 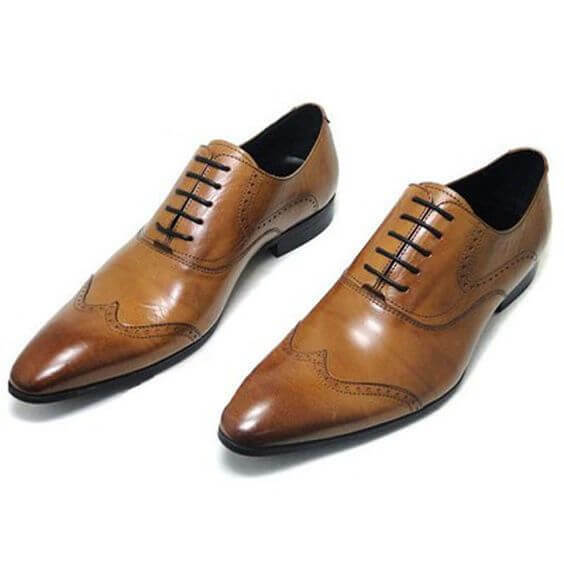 For everyday wear to the office or contemporary events, Oxfords in a cognac brown colour would be an excellent choice. If you intend to wear Oxfords to a more formal event, choosing leather shoes in a more traditional black would be best. Consider Oxfords with highly polished, shiny finish, as well. 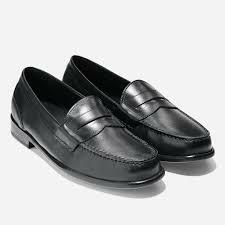 Loafers are perhaps best known for their total lack of laces and buckles. They are designed as slip-on shoes with a wide, flat heel. Commonly thought of as a dressy sport shoe, loafers are a popular choice at yacht clubs. Some dressier loafers have tassels, but more modern and casual styles generally do not. Older styles of loafers were designed with a strap across the top of the leather shoe, such that it could hold change or another small item. This is where the term ‘penny loafer’ originated. Some consider cap toes to simply be decorated Oxfords. Although numerous frills or embellishments can be used to make a leather shoe more unique, cap toes on Oxfords are the most common. While Oxfords are well known for their simplistic style, cap toe shoes are considered to be more formal largely because of their additional decoration. 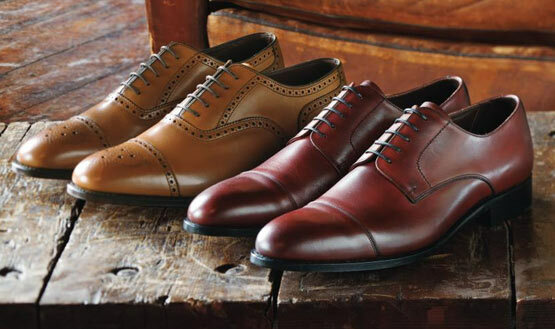 What defines a cap toe leather shoe is the band of leather over the toe, which helps to explain how its name originated. To be clear, when choosing leather shoes, boots are an option. That said, dress boots are generally only ankle-length – certainly not the same dimensions as a traditional work boot or snow boot. 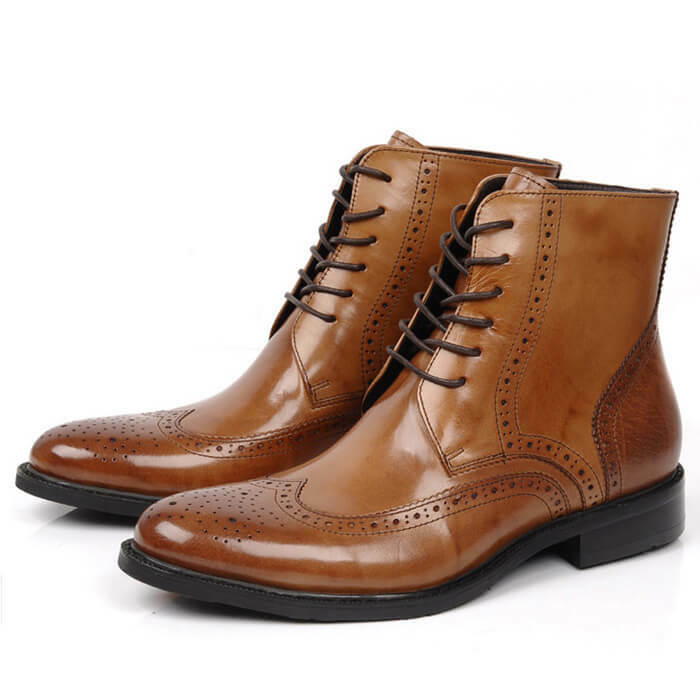 Dress boots are most often kept well-polished and are sometimes decorated with perforations in a wing-tip pattern. Dark jeans, a casual suit, or a pair of trousers would pair well with dress boots. In fact, most men wear dress boots only in a casual or semi-formal setting. 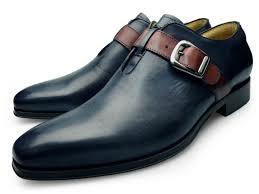 Monk strap shoes are similar to loafers in the sense that they have no laces; however, a leather strap is placed across the upper portion of the shoe. This is more for decoration or embellishment than any functional purpose. The leather strap is connected to a clasp or a metallic buckle that appears to keep the shoe fastened. Because of the additional hardware on this style of shoe, they are to be worn in a slightly more casual setting.